Farming is a members-only skill that is usually viewed as too slow and expensive and boring to be worth training. But by using chain farming, Farming can actually be fun, easy, and almost cheap. Chain farming is simply, well, farming in a chain; that is, going through a pre-determined route that takes you to many different farming patches, where you harvest your crops, plant some new ones, and then quickly go to the next one. By using chain farming instead of farming just one patch, you can get many times the experience for a fraction of the time, and by planting herbs you can actually make a profit! Sounds too good to be true? Get all the information you need to know about chain farming from this guide, and give it a try! Different people have their different ways of raising farming, so to meet everyone's requests, five different routes have been included. However, not all routes are recommended; depending on your Farming level, your budget, and your preferred rate of gaining experience, there will be different recommended routes for you. Below, the five different routes contained in this guide are listed, including their characteristics and who they're recommended for. Recommendation: Not the fastest experience for its level range; allotment and bush patches are generally considered to give too low experience to be worth the time it takes to farm them. But if you enjoy going to them anyway, then go for it! Recommendation: This gives the best experience between levels 1-27. At level 12 you can plant trees, but allotment/flower/herb patches give good experience by themselves. Recommendation: This gives the best experience from level 27 all the way to 99! You can switch between this route and trees only (route #4) whenever you want, as trees take only between 5-7 hours to grow while fruit trees take almost 15 hours. Recommendation: Used in conjunction with route #3, this gives the best experience from level 27 to 99: since fruit trees take 15 hours to grow while trees take between 1/3 and 1/2 of that time, you can do just trees a couple of times while you wait for your fruit trees to grow. This also gives good experience from 12 to 27 if you don't like dealing with allotment patches. Recommendation: Herbs are a great way of making money. (For more information on growing herbs, see our excellent "Making Money with Farming" guide, also on Sal's Realm of RuneScape.) If you want to try to make up for your cash deficit while doing route #3, you can throw in these herb patches as well. You don't lose any xp, but the route is slightly more time-consuming. Besides having level 27 Farming, all of the other requirements are optional; you can walk to the Champion's Guild bush patch instead of using the canoe, you can skip the patch in Morytania if you have not completed Ghosts Ahoy, and you can skip the three gnome-related tree and fruit tree patches if you have not yet completed The Grand Tree. Teleportation Tablets/Runes : 1 Varrock, 2 Falador or 1 Falador and a Level 3 Explorer's Ring, 1 Camelot, and (optionally) 1 Ardougne or an Ardougne Cloak 2+. Farmer Payments : 8 Allotment Patches, 5 Tree Patches, 4 Fruit Tree Patches, and 2 Bush Patches. 10,000 gp : Keep in your inventory at all times in case of an emergency. Home teleport to Lumbridge and bank in the third floor of the Lumbridge castle. Withdraw 5 tree seeds, 4 fruit tree seeds, 2 filled watering cans, 9 plant pots, and a hatchet. Walk out to the tree patch behind the castle and use your trowel to fill the pots with soil from the patch, plant your seeds in the pots, and use a watering can on each of the filled pots. Wait until the seeds grow into saplings and then go back to the bank, deposit all your saplings, and withdraw the following items: a hatchet, 1 bush seed, 1 tree sapling, the farming payments for 1 bush and 1 tree patch, and 1 Falador teleport or a Level 3 Explorer Ring. And if you don't have all the necessary tools already in the Leprechaun storage, bring them with you now. Follow the red path on the map above to the canoe station and use your trusty hatchet to make a canoe and travel to the Champion's Guild. Then head over to the bush patch west of the guild, and when you're done there, take the canoe back down to Lumbridge and follow the blue path to the tree patch on the west side of the Lumbridge castle. After you're done at the tree patch, head back up to the bank on the top of the Lumbridge castle and deposit all your items, then withdraw: 6 allotment seeds, 1 flower seed, 1 herb seed, 5 sacks/baskets, 1 tree sapling, the farmer payments for 2 allotment patches and 1 tree patch, and 1 Varrock teleport. 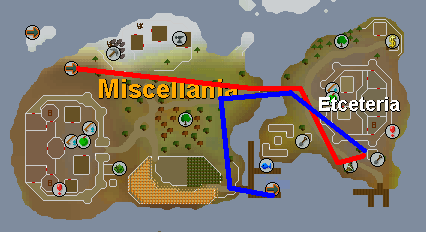 Teleport to Falador and follow the red path on the above map to the Draynor allotment patch, or cabbage-port using your Level 3 Explorer Ring and follow the blue path to the patch. After you've planted in the patches there, teleport to Varrock. After you've teleported to Varrock, follow the red path to the tree patch in the Varrock palace courtyard. When you're done planting there, follow the blue path to the Grand Exchange, where you can buy any farming items that you need for any reason, and then withdraw the following items from the bankers at the Grand Exchange: 6 allotment seeds, 1 flower seed, 1 herb seed, 2 fruit tree saplings, 3 tree saplings, 1 Ectophial, 1 Camelot teleport, 5 sacks/baskets, and 1 Falador teleport. Then go to the spirit tree north-east of the Grand Exchange and use it to teleport to the Gnome Stronghold. Once you're in the Gnome Stronghold, follow the red path to the fruit tree patch, then follow the blue path to the tree patch, then follow the yellow path back to the spirit tree and teleport to the Tree Gnome Village. In the Tree Gnome Village, head to the gate in south-west of the clearing and slip through the opening. Talk with the gnome outside the gate and ask her to guide you outside of the maze. Once you've appeared outside of the maze, follow the red path to the fruit tree patch. After planting in the fruit tree path, use your Ectophial to teleport to the Ectofuntus north of Port Phasmatys, then follow the red path to the allotment patch. After planting in the allotment/flower/herb patches, teleport to Falador. Next, teleport to Camelot and follow the red path south-east to Catherby and go to the Catherby bank. Withdraw: 12 allotment seeds, 2 flower seeds, 2 herb seeds, 5 sacks/baskets, 2 fruit tree saplings, 1 bush seed, farmer payments for 4 allotment patches and 2 fruit tree patches and 1 bush patch, 60gp, and (optionally) an Ardougne teleport. Then follow the blue path to the allotment patches, and then follow the yellow patch to the fruit tree patch. Then teleport to Ardougne and follow the red path to the allotment patch, or just run from the fruit tree patch in Catherby south-west and follow the blue path to the allotment patch, or ignore both paths and teleport to the Ardougne farm with your Ardougne Cloak 2+. Then go to the docks in the south-east corner of Ardougne and take the ship for 30gp to Brimhaven and plant in the fruit tree patch south of the dock. 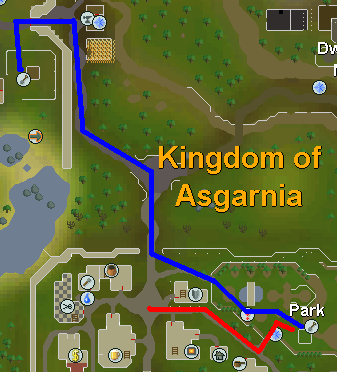 Take the ship back to Ardougne for another 30gp and follow the red path to the Bush Patch north of the small monastery. This is the route with the lowest requirements. You can do it at any Farming level, and the only quest you should have finished is Ghosts Ahoy so you can use the Ectophial to get to the allotment/flower/herb patch in Morytania more quickly. But if you haven't finished that quest, then you can just go to the three other patches instead. Teleportation Tablets/Runes : 1 Camelot, 1 Falador or a Level 3 Explorer Ring, and (optionally) 1 Ardougne or an Ardougne Cloak 2+. Bring another teleport to any place to quickly get back out of Morytania at the end of your route. First, go to any bank and withdraw the following items: 24 allotment seeds, 4 flower seeds, 4 herb seeds, 1 Camelot teleport, 1 Falador teleport (or a Level 3 Explorer Ring), 1 Ectophial, (optionally) 1 Ardougne teleport, and the noted payments necessary for 8 allotment patches. You should also withdraw one extra teleportation runes/tablet to use at the end of the route. 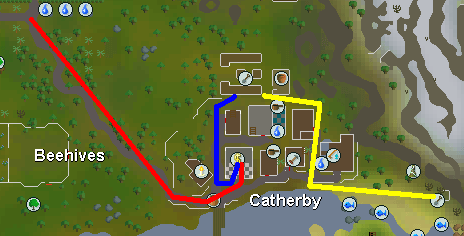 Teleport to Falador and follow the red path to the allotment patches, or use your Level 3 Explorer Ring to teleport to the cabbage patch and follow the blue path. Then teleport to Camelot, and follow the red path to the allotment patches north of Catherby. 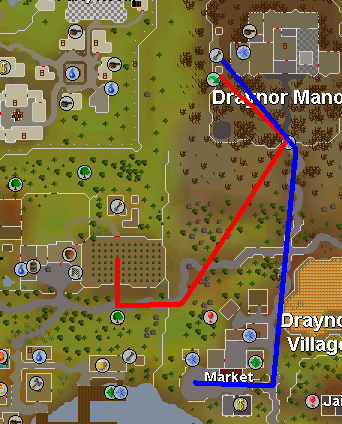 Then teleport to Ardougne and follow the red path to the allotment patch, or just run south-west from the Catherby allotment patch and follow the blue path to the patch instead, or ignore both paths and teleport to the Ardougne farm using your Ardougne Cloak 2+. After you've planted in the patches, use your Ectophial to teleport yourself to the Ectofuntus Refill your Ectophial if necessary, then follow the red path to the allotment patches, then use your extra teleport to get out of Morytania. Besides level 27 Farming, all the other requirements aren't necessary. However, if you haven't completed the Roving Elves quest then you don't have access to the Lletya fruit tree patch, and if you haven't completed The Grand Tree quest, then you can't get quickly enough to the three gnome-related tree and fruit tree patches. Teleportation Items/Runes/Tablets : 1 Falador, 1 Varrock, 1 Camelot, 1 Lletya Teleportation Crystal, (optionally) 1 Ardougne or an Ardougne Cloak 2+. Farmer payments : 5 Tree Patches, 5 Fruit Tree Patches. Home teleport to Lumbridge, then bank in the third floor of the Lumbridge castle and withdraw five tree seeds, five fruit tree seeds, two filled watering cans, ten filled plant pots, a hatchet, and any farming tools that you forgot to store with the leprechauns. Follow the red path in the image below to the tree patch behind the castle and after you've cleared the patch of anything you planted there, fill your pots with soil from the patch, put the seeds in the pots, and then use the watering cans on the pots. Wait until the seeds have grown into saplings, and then plant one of your tree saplings in that patch. Then go back to the bank in the Lumbridge castle, deposit all your tree and fruit tree saplings, and withdraw the following items: a hatchet, 3 tree saplings, the farmer payments for the three tree patches, and 1 Falador teleport. 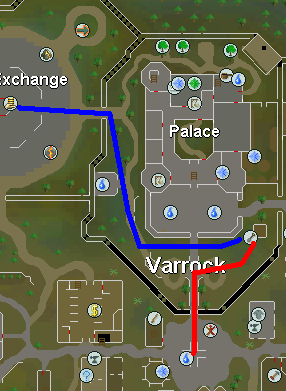 Once you've teleported to Falador, follow the red path to the tree patch in the Falador garden, then follow the blue path to the tree patch south of Taverley Then teleport to Varrock. Once in Varrock, follow the red path to the tree patch in the castle courtyard. Then follow the blue path to the Grand Exchange, where you can buy any farming supplies you've forgotten, and then withdraw: 3 fruit tree saplings, 1 tree sapling, the farmer payments for the fruit tree and tree patches, and 1 Camelot teleport. Then head north-east of the Grand Exchange to the spirit tree, and teleport to the Gnome Stronghold. Note: If you can't use the spirit tree teleportation, just teleport to Camelot right away. In the Gnome Stronghold, head east to the Fruit Tree patch. Then head south-west to the Tree patch. Then head north-east back to the spirit tree and teleport to the Tree Gnome Village. In the Tree Gnome Village, head to the south-west corner of the clearing and squeeze through the gap in the fence. Talk with the gnome outside and ask her to take you out of the maze. Then head south-west to the Fruit Tree patch, plant in it, and teleport to Camelot. Once you've teleported in front of Camelot, follow the red path and plant in the Fruit Tree patch there. Then head back east to the Catherby bank and withdraw 2 Fruit Tree saplings, a Lletya Teleportation Crystal, and the payments for those patches. From here, you have some different methods of teleportation. You can also withdraw the runes/tablet for an Ardougne teleport from the Lletya/Catherby bank or an Ardougne Cloak 2+, teleport to Ardougne, head south-east to the docks and take the boat to Brimhaven for 30gp (make sure you have another 30gp with you to get back if you need to), then head south-east to the Fruit Tree patch. You can also withdraw a charged Amulet of Glory, teleport to Karamja, and then run east until you enter Brimhaven. Then head north-north-west to the Fruit Tree patch. If you have a grown Spirit Tree patch in Brimhaven, you should go to this Fruit Tree patch while you are currently in the Varrock area or the either of the two Gnome areas. After you have planted in the Fruit Tree patch in Brimhaven, teleport to Lletya using your teleportation crystal if you have one. If you do not have the crystal (a reward from the Mourning's End Part II quest), just home teleport to Lumbridge, and look below for the options that you have after doing this route. One in Lletya, just head south-east to the Fruit Tree patch. After you have planted in the patch, you have a couple of options for what you do next. All Fruit Trees take about 14.6 hours to grow, so you have a lot of time to fill in. You can go and complete Route #2 (the Allotment/Flower/Herb route) many times, or you can just do whatever else you want to do. If you have a medium to low Farming level, it is highly recommend that you complete Route #2 because the experience that you get will be very helpful. However, once you start getting extremely high levels and the levels can be separated by hundreds of thousands of experience, to avoid "burning out" you should just take a break from Farming every now and then. But then again, it's just a matter of preference. This route has rather low requirements. You only need level 12 Farming to complete the route, and the only quest required is The Grand Tree, and if you haven't done The Grand Tree, you'll only miss out on one tree patch. Teleportation Runes/Tablets : 1 Falador, 1 Varrock. 10,000gp : Keep in your inventory at all times in case of an emergency. Home teleport to Lumbridge, then go up to the third floor of the Lumbridge Castle and make a stop in the bank. Before you withdraw any other items, withdraw five Tree seeds, one filled watering can, and five filled Plant Pots (if they are not filled, you can walk over to the Tree Patch behind Lumbridge Castle and get them filled). Plant the seeds in the filled Plant Pots, and water them. Go back to the bank, deposit all your Tree Saplings, and withdraw the following items into your inventory: a Hatchet (or have 200gp for every grown patch that you go to), 5 Tree Saplings, the payments for your Tree patches, 1 Varrock teleport, and 1 Falador teleport. If you're missing some of the items in Leprechaun Storage, make sure to bring those items with you to store them in the Lumbridge Tree patch Leprechaun. Follow the red path on the map above to the Tree patch on the west side of Lumbridge Castle. Check the health of your tree there (if there is one), have it chopped down or chop it down yourself, and then plant your Tree sapling in the patch. Then teleport to Falador. When you have arrived in Falador, follow the red path and plant in the Tree patch there. Then follow the blue path and plant in the Tree patch there. Then break your Varrock teleport. Once in the Varrock square, follow the red path and plant in the Tree patch there. Then follow the blue path into the Grand Exchange. If you wish to buy any new seeds or supplies, probably for your next route, then do so here. Once you're done, head north-east to the spirit tree. Use the spirit tree to teleport to the Gnome Stronghold. Then follow the red path to the Tree patch there and plant in it. Now, all you need to do is wait for a couple of hours until your trees have grown! Depending on your level (click here for the recommended routes at each level), you can do some rounds of Route #2 until your trees have grown, or you can take a break from Farming and do something else entirely; it's a matter of preference. Besides having level 27 Farming, all of the other requirements are optional; you can walk to the Champion's Guild bush patch instead of using the canoe, you can skip the patch in Morytania if you have not completed Ghosts Ahoy, and you can skip the three gnome-related tree and fruit tree patches if you have not yet completed The Grand Tree. If you have not completed Eadgar's Ruse, then you can just skip the Trollheim disease-free herb patch. Teleportation Items/Runes/Tablets : 1 Falador, 1 Varrock, 1 Camelot, 1 Lletya Teleportation Crystal, 1 Falador or a Level 3 Explorer Ring, 1 Ectophial, 1 Trollheim, (optionally) 1 Ardougne or a charged Amulet of Glory or an Ardougne Cloak 2+, and one teleport to anywhere to use at the end of the route. 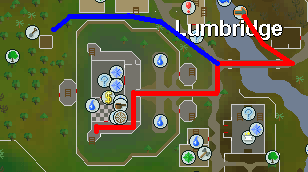 To begin your route, home teleport to Lumbridge and walk up to the bank on the third floor of the Lumbridge castle. Withdraw ten filled plant pots, your five tree seeds and five fruit tree seeds, and two watering cans (if your plant pots are not filled with soil already, fill them at the Lumbridge Tree Patch by using them on the patch while having a gardening trowel in your inventory); use the seeds on the plant pots and then use the watering can(s) on the plant pots, and after waiting for a few minutes, you will have ten Tree/Fruit Tree saplings. Store your saplings in the bank and withdraw the following items: a Woodcutting Hatchet (you can wield it to save inventory space), three Tree Saplings, two Fruit Tree saplings, a Varrock teleport, your 10k gp, and any items in the list above that aren't yet in your Leprechaun Storage. Go down the stairs to ground level and follow the red path on the map above to the Tree Patch there. Cut down your tree if there is one there, use your spade to get up the roots, use some supercompost/compost on the patch, use your Tree sapling on the patch, and right-click on the farmer and select "Pay" to give him your produce so that your tree definitely will not die. Then break your Varrock teleport. 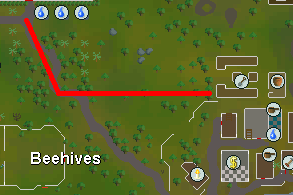 Once in Varrock, follow the red path north into the castle grounds and plant in the Tree patch there. 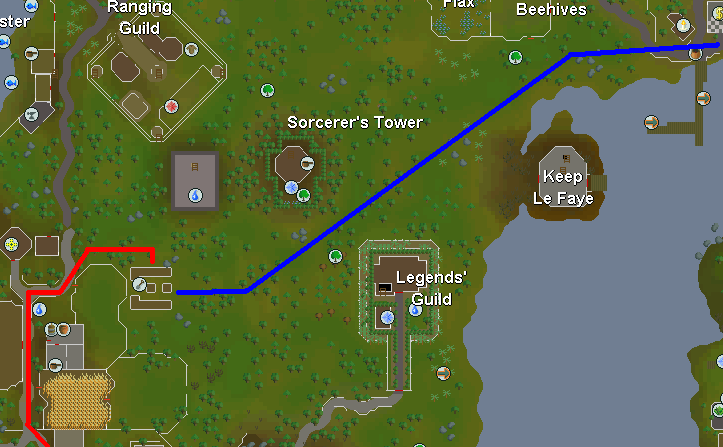 Then follow the blue path east to the Grand Exchange; if you have forgotten any supplies or Farmer payments or anything you could possibly need for the rest of the route, buy them here. Once you have done that, head east to the fountain and refill your two watering cans; you will need them when you are planting your herbs. Then head north-east of the Grand Exchange to the spirit tree and teleport to the Gnome Stronghold (you will probably need to use the Tree Gnome Village as a hub, though). Once you have teleported into the Gnome Stronghold, follow the red path east to the Fruit Tree patch. Plant in it, and then follow the blue path south-west to the Tree patch there and plant in it. From there, climb up the nearby stairs to the bank and deposit everything except for your 10k gp, your woodcutting hatchet, and the two watering cans, and withdraw the following items: two Tree saplings, three Fruit Tree saplings, five Herb seeds, a Falador teleport, a Level 3 Explorer Ring or a Falador teleport, your Lletya Teleportation Crystal, a Camelot teleport, an Ardougne teleport or an Amulet of Glory, your Ectophial, and a Trollheim teleport. Then teleport to Falador. In Falador, follow the blue path east to the Tree patch in the Falador Park. 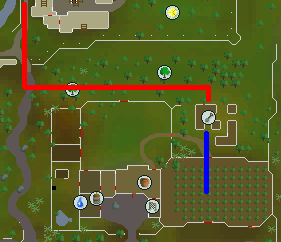 Plant in it, and then follow the red path north to the Tree patch in Taverley Plant in it, and then either teleport to Falador or teleport to the cabbage patch using your Level 3 Explorer Ring. 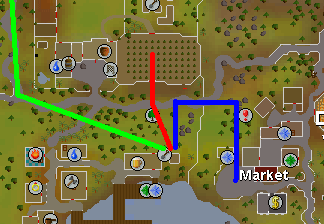 If you teleported to Falador, follow the red path to the Herb patch, and if you teleported to the cabbage patch, follow the blue path. Plant in the herb patch (you MUST use supercompost, since it will give your herbs a much better chance of survival and it will increase the harvest of herbs), and then use your Lletya Teleportation Crystal. Once in Lletya, follow the red path south-east to the Fruit Tree Patch and plant in it, then teleport to Camelot. Once you have teleported in front of Camelot Castle, follow the red path south-east to the Fruit Tree patch east of Catherby and plant in it. From here, you have some different methods of teleportation. First, you can teleport to Ardougne using the teleport tablet/spell or the Ardougne Cloak 2+, follow the red path in the map above to the docks, take the boat for 30gp to Brimhaven, and head south-west to the Fruit Tree patch. Second, you can teleport to Karamja using your Amulet of Glory, then run west past the Brimhaven gate to the Fruit Tree patch near the docks. Either way, plant in the Fruit Tree patch and then use your Ectophial. Once you have teleported to the Ectofuntus, north of Port Phasmatys, follow the red path to the Herb patch and plant in it, and then use the Trollheim Teleport. From the Trollheim teleport spot, climb down the mountain and follow the red line through the troll camp (using this page as a guide if you get lost) until you reach the herb patch. It is disease-free, but still use super compost to get a better herb yield. From here, use your extra teleport that you hopefully brought with you; if you forgot to bring it, wait for around ten minutes or less and you will be able to use your Home Teleport. The herbs will take around an hour to grow, your trees will take around 5-6 hours to grow, and your fruit trees will always take 14.5 hours to grow. If you wish, you can go to all the patches listed in Route 2, but with only five herb seeds and no allotment/flower seeds, around half an hour after you finish this route. You can also wait until the following day to follow Route 5 again. Whatever you do, remember that your crops grow even when you're offline! While there are many patches that fit into the conventional categories, like Tree patches and Flower patches and Allotment patches, there are also many patches that do not fit with any of the others, such as a Mushroom patch and a Cactus patch. Many of these are very good for experience when included in a Chain Farming route, but some also have a special use of their own that is applicable to Farming or to even another skill. In this section of the guide, every special Farming patch is listed, along with all the other information that you will need. Location: South-east Etceteria, below the Etceterian Castle. How to Get There: There are two possible ways to get here. The quickest and easiest way is, if you have unlocked the use of the Fairy Rings by getting part of the way through A Fairy Tale Part II, to go to the nearest Fairy Ring and go to coordinates CIP, and follow the red route in the map above. The longer way is to arrive in the Fremennik Harbor and take the eastern boat by either: using an Enchanted Lyre and going and going north-north-west to the harbor, or Home Teleporting using the Lunar Magic spell book and taking the boat back to the Fremennik harbor; once in Miscellania, follow the blue path in the map above. Nearest Bank: The nearest bank is on the other side of the castle, up north. Farmer Payment: 5 Monkey Nuts, 1 Monkey Bar, and 1 Ground Suqah Tooth. The Monkey Nuts and the Monkey Bar can both be bought from the food stall on Ape Atoll. Getting the ground Suqah Tooth requires at least starting Lunar Diplomacy so that you can kill the Suqahs and get their occasional drop of their tooth. Where to Get the Seeds: Getting Spirit Seeds is very rare. They are found as a rare item in Birds' Nests; you can get them when they appear randomly behind you while woodcutting, or from the gardener in Falador park if you bring the hide and claws of the Giant Mole (obtainable from the Grand Exchange or slaying the Giant Mole yourself).They are also obtainable from spending Pest Control points on seeds, although this is very rare. The only way of getting a spirit seed with no luck involved is by spending 55000 points to buy one in the Vinesweeper Activity. Special Notes: Besides giving a whopping combined planting and checking health Farming experience of 19501.5, if you have completed both the Gnome Stronghold and Tree Gnome Village quests, you can teleport from and to your spirit tree as part of the entire network of spirit trees. Note: You can only have ONE spirit tree at a time; therefore, decide very carefully where you are going to plant your spirit tree, since it will be very difficult to obtain another seed. And it is well worth your time to obtain all the parts of the farmer payment when you're ready to plant your spirit tree. You definitely don't want your hard-earned spirit seed to be wasted by having your tree die of disease. How to Include This in Your Route: The only reason that you would need to include this in your route, after you have planted in it and the spirit tree has grown, is for easy access to the Etceteria bush patch. You can also use it for quick access to Miscellania/Etceteria, most likely to be able to quickly access the "Managing Thy Kingdom" Activity. It is recommended to go here while you are in the Gnome area, or the Varrock/Grand Exchange area, so that you have access to the spirit trees' teleportation matrix. Patch Requirements: None are required besides 83 Farming, but it is useful to have completed Plague City so that you can use an Ardougne teleportation tab/runes or at least the Medium level of Ardougne Tasks to use the Ardougne Cloak 2+. How to Get There: The easiest way to get here is to teleport to Ardougne using the tablet/spell or the Ardougne Cloak 2+, walk to the docks south-east of the southern bank, then take the boat for 30gp (bring another 30gp if you plan to return using the boat) to Brimhaven, and follow the red path. You can also walk to Port Sarim from wherever you are at the moment, take the boat to Karamja, then run west until you pass through the Brimhaven gate, and then head north-west until you see the patch (not shown in the map above, use the RuneScape map for assistance). 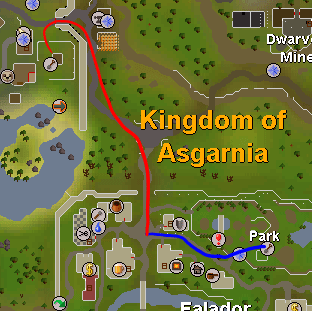 Another way is to use the Amulet of Glory Karamja teleport and then run east through the Brimhaven gate then north-west to the Farming patch (not shown in the map above, use the RuneScape map for assistance). Nearest Bank: South-east Ardougne bank north of the Ardougne docks. How to Include This in Your Route: The reason why you would plant in this particular patch is that if you can use the spirit tree teleportation matrix, you have instant access to the Fruit Tree patch just east of here. Therefore, it is recommended to go to this patch while you are in the Varrock area, the Ardougne area (a tree is North-East of the Gnome-Khazard Battlefield) or either of the Gnome cities so that you have close access to the other spirit trees. Patch Requirements: None are required, besides level 83 Farming. 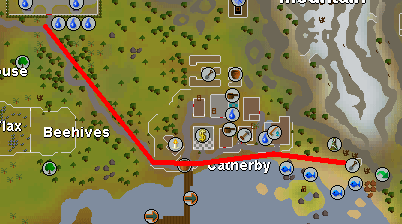 How to Get There: If you have completely finished the Lumbridge/Draynor Tasks (Beginner, Easy, and Moderate levels), you can use the Cabbage Teleport option on your Level 3 Explorer Ring to teleport to the cabbage patch just north of this patch and then follow the red path. You can also use an Amulet of Glory teleport to Draynor and then follow the blue path. 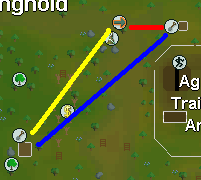 If you don't have access to either of these methods or teleportation, you can use runes or a tele tab to teleport to Falador and then follow the green path. Nearest Bank: Draynor Village bank to the south-east or Falador bank to the north/north-west. How to Include This in Your Route: There are two patches that are close to this patch: the Draynor/Falador Allotment patch and the Rimmington bush patch. Teleporting to this patch using the spirit trees in Varrock or either of the Gnome areas is the best time to go to this patch. However, this is not the best patch in which to plant your spirit tree because there are better ways of teleportation to those two patches. If you have the Explore Ring Level 3, you can use the Cabbage Patch teleport to appear closer to the Draynor/Falador Allotment patch than you would be if you teleported to the Draynor spirit tree patch. If you have your house in Rimmington, you can house teleport and you will be a lot closer to the Rimmington Bush patch than you would if you teleported to the Draynor spirit tree patch. Location: North of Tai Bwo Wannai, just east of the anvil. Patch Requirements: No requirements besides level 72 Farming. How to Get There: The first way is to use the fairy ring to teleport to coordinates ?? ?, which will take you south-west of Tai Bwo Wannai, and follow the red path The second way is to teleport to Ardougne using the tablet/spell or the Ardougne Cloak 2+, head south-east to the docks (with 30gp or 60gp, depending on whether or not you wish to sail back to Ardougne) and take the boat to Brimhaven, then head south and then follow the blue path. You can also go to Port Sarim, take the boat to Karamja, run west to Brimhaven, head south west, and then follow the blue path. Nearest Bank: There are none nearby, so make sure to bank before you enter Brimhaven/Karamja. Farmer Payments: 8 Poison Ivy Berries. Special Notes: Calquat Trees also give a large amount of Farming experience: 12,096 experience! If you have enough time to go to this out-of-the-way patch, you really should. How to Include This in Your Route: If you have completed the Plague City quest or completed at least the Medium level of Ardougne Tasks, you should just teleport to Ardougne using the tablet/spell or the Ardougne Cloak 2+ and then take the boat to Brimhaven, so you can technically go to this patch anytime. However, if you are going to the Brimhaven Fruit Tree patch, then it would make sense to go to the Calquat Tree patch while you're in Brimhaven, too. If you are using the Amulet of Glory teleport, if you can just go to it anytime because you're carrying around your method of teleportation with you. Location: In Al Kharid, north of the General Store and east of the Silk Stall. Patch Requirements: There are no requirements, besides level 55 Farming. 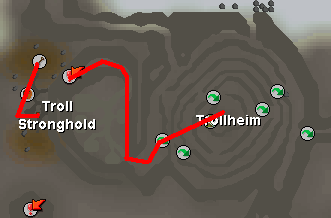 How to Get There: The fastest way is to teleport to Al Kharid using the Amulet of Glory, and then follow the blue path. You can also teleport to the Duel Arena using your Duelling Ring and then follow the red path. A duelling ring is very cheap; don't worry about the cost, even if you have a tight budget. Nearest Bank: West of the Al Kharid Palace, south-west of the patch. Farmer Payments: None, unfortunately, so using supercompost is vital! Sometimes it will die, but hey, that's just the circle of life. Where to Get the Seed: The easiest place to get a seed is to buy it from the Grand Exchange; it's extremely cheap (less than 250gp). Special Notes: You can get cactus thorns, which can be useful. As of mid-June, 2010, one cactus spine alone sells for over 6,000 gp (keep in mind that at this point, the price was on the rise; check the current Grand Exchange price for yourself before you add this patch to your route), as it is used in Herblore to make Weapon Poison(+) and in Farming as a farmer payment for Yew Trees. How to Include This in Your Route: This patch is the only Farming patch in the Al Kharid area, and the closest patch to it is the Tree patch west of the Lumbridge castle; therefore, including this patch in your Chain Farming route will not add enough experience to your route (compared to the huge experience-gain of planting trees and fruit trees) to really be worth the extra time. The real allure of this patch is the cactus spines recovered from the plant when harvested (read the "Special Notes" section above); if you want a source of extra cash in your route, possibly between 10-20k gp, or you wish to use the cactus spines yourself without having to buy them on the GE (both of which save you the same amount of money), then you will find that there's really no "best" ordinal place to put this in your route, since it's wisest to simply teleport using a Duelling Ring, which can be done from anywhere. Location: In Ardougne, in the garden in the mansion just west of the Ardougne market. Patch Requirements: Completion of the Back to my Roots quest, and level 53 Farming. Plague City or the Medium level of Ardougne Tasks is recommended. 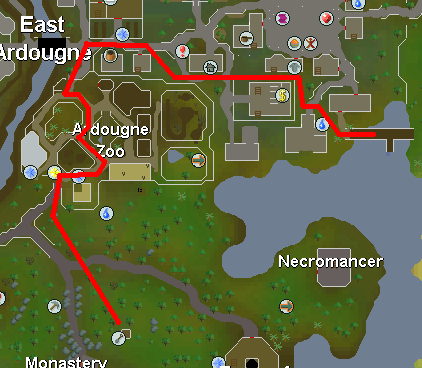 How to Get There: The fastest way is to teleport to Ardougne using either the tablet/spell (requiring completion of Plague City) or the Ardougne Cloak 2+, then follow the red path to either of the two Jade Vine patches. Nearest Bank: There are two bank nearby, about equal distances from the patch. One is north-west of the patch and the other is south-east of the patch. Farmer Payments: 10 Wildblood Hops. Where to Get the Seed: The easiest place to get a seed is to buy it from the Grand Exchange. Special Notes: You can prune your Jade Vine with secateurs, similar to getting branches from one of your Trees, which gives 30 Farming experience per branch. Also, if you let the vine grow (no pun intended) wild, you can kill it to get 2500 Slayer experience. How to Include This in Your Route: Since this is in Ardougne, obviously you should go to this patch while you are in Ardougne. Nearby patches are the Ardougne Bush Patch, the Ardougne Allotment Patch, and the ship to Brimhaven (which has the Brimhaven Fruit Tree Patch and Spirit Tree Patch) is nearby. If you are going to either of these patches, go to this patch at the same time. If you aren't going to any of these patches, just bring an Ardougne teleport with you and use it whenever you're ready. Location: In the Draynor Mansion grounds, to the west of the actual mansion and next to the fence. It is south of the Evil Turnip patch; don't get them confused. Patch Requirements: You need to wear leather gloves when you're planting here; Belladonna is poisonous! You also need level 63 Farming. How to Get There: There are two good ways to get to the manor. The first way, and the quickest way, is to teleport to Draynor using an Amulet of Glory, then head follow the blue path. The second way is to teleport to the Cabbage Patch using the Level 3 Explorer Ring, then follow the red path. You can also just walk to here from Lumbridge or Falador, but that is not recommended. Nearest Bank: Draynor Village bank. Farmer Payments: None, so using super compost is vital! Where to Get the Seed: The best place is to buy it from the Grand Exchange. 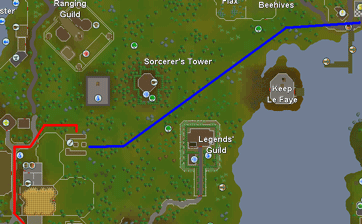 How to Include This in Your Route: To mesh this in with a route that includes Allotments, the best place to include this patch is when you are going to the Draynor/Falador Allotment patch because it is so close by. If you are doing a route with only Trees (and/or Fruit Trees) (and going to this patch, or any special patch besides the Calquat Tree patch and on occasion the Spirit Tree patches, is not recommended), when you're going to the Lumbridge Tree Patch, you can either teleport to Draynor using your Amulet of Glory (recommended) or walk all the way to the manor (not recommended). Location: In the Draynor Manor grounds, west of the manor, north of the Belladonna patch. It is not marked on the minimap with a patch icon. Patch Requirements: None, besides level 42 Farming. How to Get There: There are two good ways to get to the manor. The first way, and the quickest way, is to teleport to Draynor using an Amulet of Glory, then follow the blue path. The second way is to teleport to the Cabbage Patch using the Level 3 Explorer Ring, then follow the red path. You can also just walk to here from Lumbridge, but that is not at all recommended. Farmer Payments: None, so using supercompost is vital! Special Notes: Used in summoning pouches; refer to the Summoning Skill Guide for more details. Location: South-west of Canifis, north of the gate to the Mort Myre swamp. Patch Requirements: Completion of the Priest in Peril quest, besides level 53 Farming. 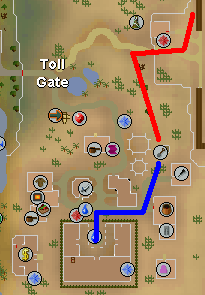 How to Get There: The two fastest ways are to teleport to Fairy Ring coordinates CKS and follow the very short blue path, or to use the Ancient Magicks Kharyll teleport to arrive in Canifis and to then follow the red path. You can also use your Ectophial (needs completion of the Ghosts Ahoy quest), then follow the green path. Finally, if you have no other option, you can walk all the way from Varrock to the temple, go through the underground part of the temple, and then follow the yellow path. Nearest Bank: On the east side of Canifis, which is to the north-east of the patch. Where to Get the Seed: Best place is to buy it on the Grand Exchange. How to Include This in Your Route: Seeing as there is no other patch nearby (although there is the Morytania Allotment patch near the Ectofuntus), if you go here you'll be going here only so that you can plant in the Bittercap Mushrooms patch, so go here whenever you feel like it. However, if the only teleportation method that you have access to is the Ectophial, you should probably go to this patch right after you go to the Morytania Allotment patch. For help on figuring out what you need to pay the farmer for him/her to look over your crops, refer to our excellent Farming Help guide, also on Sal's Realm of RuneScape. To help you know when your Fruit Trees and Trees are ready to have their health checked, Jagex has provided a nice means. In any Farming Shop, you can buy an Amulet of Farming for a rather cheap price. You can have more than one of them, but all of them will be attached to the same patch, so it's the same as if you had only one of them. To use it, you must use it on a patch to bind all your amulets to it. Then when you talk to it, you can see whether or not that patch is healthy or diseased; the amulet also offers free teleports to diseased patches. If you are running out of space in your inventory, you can ask any nearby Tool Leprechaun to change your produce from your patches into stackable bank notes. If you are going to an Allotment patch, you could possibly put your produce in sacks or baskets and then note them, or just note the individual produce itself; if you are going to any other type of patch, just note them individually. Do not wear any armor while Chain Farming! You will be doing a lot of running, and you will want to conserve as much run energy as possible. Items like the Boots of Lightness and the Spotted/Spottier Cape are recommended. And to put some more fun into your route, if you are the fashionable type, now is your chance to prance around the realm of RuneScape while showing off your wealth or style by wearing the best fancy and light clothes you have! Farmers will accept noted payments, so don't worry if you have need to bring four or five baskets of produce; just note it and it will fill only one inventory spot! Once you reach level 52 Farming, if you are still doing Allotments (which is not recommended, unless you, for some reason or another, love to plant in Allotment/Flower/Herb patches), you can plant a "White Lily" in your Flower patch. It will make Farmer payments unnecessary, for it protects all fruits and vegetables in your Allotment patches; all other flowers just protect only one to three types of crops. Despite not being the fastest form of Farming experience, Herbs are a good source of money. For more information on Herb Farming, click here. If you wish to save inventory spaces when teleporting to Ardougne, the "Recommended Items" lists recommend either an Ardougne teleport or an Ardougne Cloak 2+ (gotten as a reward from completing the medium and hard (respectively) sections of Ardougne Tasks). Using an Ardougne Cloak will save you sometimes-valuable inventory space, as long as you keep in mind that an Ardougne Cloak 2 will give you only one teleport per day and an Ardougne Cloak 3 will give you two.